Cuba's parliament has picked Raúl Castro's right-hand man, Miguel Díaz-Canel, as the sole candidate to succeed him, ending the family's long rule. Mr Castro took over as president from his ailing brother Fidel in 2006. An improvement in relations with the US which began under Barack Obama has been partially reversed since Donald Trump entered the White House. Mr Castro is expected to remain a powerful influence in the communist state even after he steps down. The National Assembly has voted on the nomination but the result will not be announced until Thursday, when he is expected to formally pass the presidency to Mr Díaz-Canel. However, he will stay on as head of the Communist Party until its next congress in 2021. The next Cuban leader will inherit a country in economic stagnation and with a young population impatient for change, BBC Cuba correspondent Will Grant reports. There is also the complex task of leading without the same revolutionary past embodied by Raúl and Fidel, who died in retirement aged 90 in November 2016. Did Fidel Castro's name kill his son? 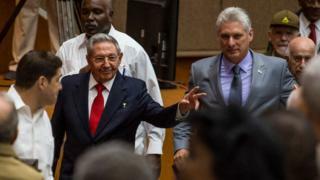 He may have had a relatively low profile when he was first appointed vice-president of Cuba's Council of State in 2013 but he has since become Mr Castro's key ally. For the past five years, he has been groomed for the presidency and the handover of power. But even before being named first vice-president, the 57-year-old had already had a long political career. He was born in April 1960, little over a year after Fidel Castro was first sworn in as prime minister. He studied electrical engineering and began his political career in his early 20s as a member of the Young Communist League in Santa Clara. While teaching engineering at the local university, he worked his way up the ranks of the Young Communist League, becoming its second secretary at the age of 33. Raúl Castro has praised his "ideological firmness". In some respects, Miguel Diaz-Canel is a departure from the past. He is in his 50s and he wasn't even born until after the revolution took power. Yet, he still represents an extension of the Castro model - especially politically. The message of political continuity which the Cuban government has stressed from the moment the handover was announced has taken much of the wind out of the sense of renewal. At least two of Raúl Castro's inner circle, men in their late 80s, have remained on the Council of State. The biggest challenges, at least in the short term, are economic. He must tackle a complex dual currency system while trying to make sure inflation doesn't rise for ordinary Cubans. He must also try to stimulate a stagnant economy. Many are watching to see if he reverses the freeze on new private business licences to at least signal some support for the concept of private enterprise on the island. All of this, without the same popular backing of the Castros. He may have his work cut out. Will the new president bring real change? He is unlikely to make any major changes in the short term, especially while Mr Castro remains a political force to be reckoned with. Any changes are likely to be gradual and slow-paced. Yet Mr Castro did bring in reforms after he took over as president, most strikingly the thaw in relations with the US which had seemed unthinkable under his brother Fidel. The new leader will have to consider how to overcome the problems caused by the economic collapse of Cuba's ally, Venezuela, and what kind of relationship the Caribbean island wants with the US under Mr Trump. Last year, the new American president reimposed certain travel and trade restrictions eased by the Obama administration but did not reverse key diplomatic and commercial ties. But what most Cubans will judge the new leader on is whether their day-to-day lives improve. "Right now, we don't know what the future holds," Adriana Valdivia, 45, a teacher in Havana, told Reuters news agency. "Raul is finished and Fidel is history. I can't see a way out to help Cubans live better, salaries are the same and don't make ends meet, and now Trump is tightening the screws with the blockade, imagine that." "Politics is not my strong point," said Diadenis Sanabria, 34, who works in a state-owned restaurant in the Cuban capital. "But I don't think a change of chief is going to change my life." How representative is Cuba's National Assembly? Often regarded as a rubber-stamp body, it is officially meeting to swear in its 605 members, who were elected last month. It also votes on the composition of the all-powerful Council of State, whose president serves as both head of state and government. Cuba has long maintained it has one of the most inclusive and fairest election systems in the world but critics say that assertion is laughable as the process is fully overseen by the ruling Communist Party. All 605 candidates stood unopposed in March.